I'm Carolina, I'm 23 years old, and I volunteer for LEAP Sports. I've always loved sport and the outdoors, and I believe there's something out there for everyone! When I'm not campaigning for LGBTQI+ rights in sport, I like to collect queer & feminist postcards, and have a bit of a boogie. I moved from Portugal to Scotland in September 2013 to study Sport Science at the University of Edinburgh. I then did a master's in Sport Policy, Management & International Development, and got involved with LEAP last year while working on my dissertation on Transgender Inclusion in Scottish Rugby. I have also just started a new role as Diversity & Inclusion Youth Ambassador at the Scottish FA. Volunteering has always been a big part of my identity. I believe it gives you invaluable life skills, and is a fantastic way to give back to your community. 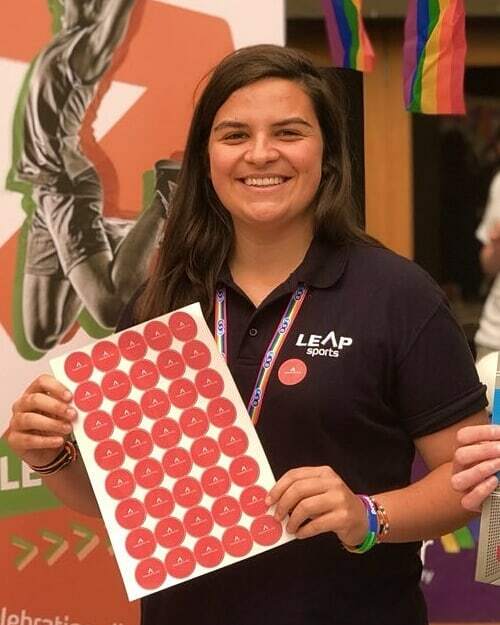 In the past year as a LEAP volunteer, I've been involved in numerous projects, such as Festival Fortnight, Edinburgh and Glasgow Pride, Football v Homophobia, Pride House and the Youth Activist Academy. For me, LEAP is like another family, and it represents everything that I'm passionate about. Come volunteer for us, and become a part of our LEAP family! One of the highlights from my time volunteering with LEAP definitely has to be Pride House Glasgow during the 2018 European Championships. We hosted several different cultural, social and sporting events in and around the PH space, so there was always something exciting going on. Any passersby who we convinced to come inside were also pleasantly surprised, and it was great to see all the hard work paid off. Glasgow Pride was another really fun event because we got a big group together and marched in the parade!